I’ve been to Khyber Pass Pub countless times. They’ve got an amazing craft beer selection, a Nawlins-style weekend brunch, mac & cheese that I have dreams about, and the most delicious Po’ Boys this side of the Mason-Dixon line (including an awesome Vegan “fried chicken” one!). But the one thing I hadn’t tried before was their burger – until now! The Khyber Burger consists of an Angus beef patty topped with bacon, barbeque onions, smoked cheddar & creole mustard. They also let you choose from any of their Southern-style sides. I went with onion rings since 1) a lot of places don’t usually have onion rings as an option & 2) onion rings are the best! I apologize for the poor lighting on the photo, but it was a little dark where I was sitting & a giant Happy Hour group was blocking my outside light. The onion rings had a nice, flaky batter on them so I added a few to the top of my burger before diving in. In addition to the barbequed onions already on the burger, the onion rings added some extra sweetness and texture (this is the go-to move!). The bun was a big, shiny brioche, much like the kind used at their sister restaurant, Royal Tavern. The bacon was crispy and the Creole mustard gave the burger a nice little tang. The patty was given a perfect bar char, but unfortunately was overcooked to medium-well/almost well done. The first few bites were juicy, but it was clear the meat was holding in too much heat; I found myself needing more ketchup to cover up the dried-out taste as I continued on. The burger to bun ratio was excellent, and I never once feared it would fall apart or that I would run out of meat before bun (or vice versa). I was a little disappointed since everything else I’ve ever eaten here has been outstanding. Maybe because they have so many other great Southern sandwiches their burger just isn’t a main focus? Or maybe it’s my own fault that I didn’t just order a Fried Mac & Cheese Po’ Boy instead! Either way, Khyber Pass Pub is worth checking out – even if you don’t try the burger. 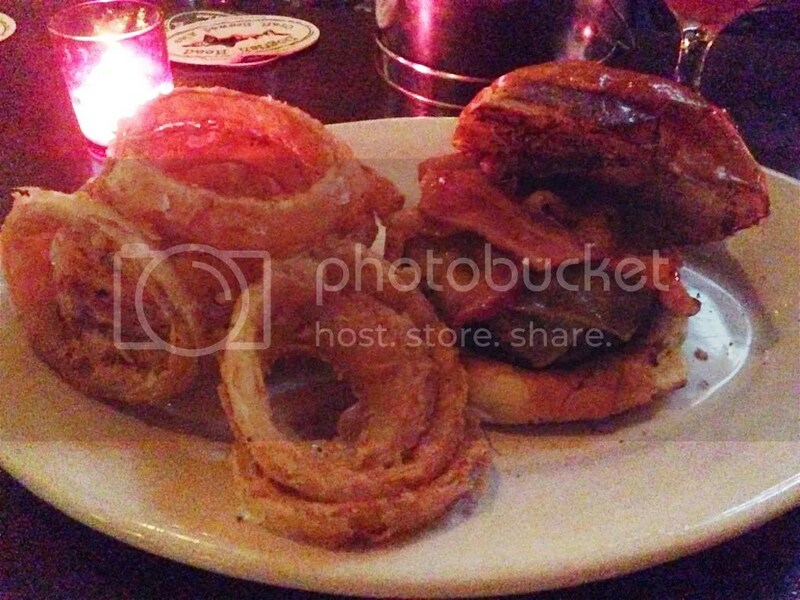 Posted in bacon, bar burger, bbq, beer, brioche, buns, burger, char, cheddar, creole, Khyber Pass Pub, onion rings, onions. Bookmark the permalink.